The Day Before is the second book I’ve read and enjoyed by Lisa Schroeder. The first book was I Heart You, You Haunt Me, which I really liked. 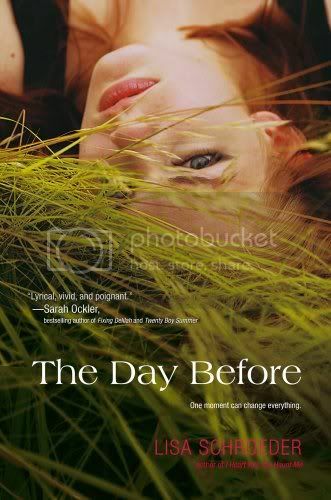 The Day Before is a touching, lyrical read that kept me guessing until the end. There aren’t too many characters to follow in the book. I found the two main characters, Amber and Cade, to be very likeable. I enjoyed their relationship together, how they were there for each other, even though they had only known each other a short while. Both had a major issue going on in their life, which ends up bonding them together. I connected more with Amber than I did with Cade, but I’m assuming that is because it’s her story, and we don’t know as much about Cade as we do Amber. The book is written in verse, and changes times from present to past. I didn’t have a hard time with it at all. The story was beautifully written, and easy to follow. The book was also a really quick read. I had it finished in about 2 hour’s time. I really like the cover for the book as well, it’s gorgeous. Overall, I really, really enjoyed this book. It will definitely be a welcome addition to my collection. I enjoyed the story behind I Heart You, You Haunt Me, but I have to admit that I wasn't a fan of the lyrical writing, which would put me off reading this one as it's also in verse. But, it sounds lovely and I'm sure readers who enjoy verse will love it! I have heard all kinds of amazing things about this book! I have never read anything by Lisa Schroeder, but I do have I Heart You, You Haunt Me waiting for me at the library. I also haven't ever read a book in verse so I am excited to try it out! I have heard a lot about this book. I have read only one book written in verse and found it very interesting, so I am thinking I might have to check this one out. Great review. One of my students insisted I read I HEART YOU and I'm glad she did -- so good. I have this one on my Kindle & need to read it! Great review. Glad to hear you liked this one! It was difficult for me to connect to the characters, too -- Cade for me as well -- but the writing was lovely. I can't wait for my finished copy to arrive at home so I can reread this! It's just sooo beautiful. I definitely need to read more of Lisa Schroeder's books. I've heard a lot of good things about this book! I also really love the cover!!! I'm a little nervous about reading a story in verse but I just keep seeing good reviews of this one! I don't know that I've ever read a story in verse...might have to give this one a try. I loved this book! :) I haven't seen that trailer! Thanks for sharing it, makes me want to cry probably because I already know what happens! :) Great review! I loved this book! You should try Lisa's other books. They're all amazing. Nice review!